I love when I discover a new spice or flavor because it adds a whole new dimension to cooking. Cardamom is one of those spices that was always foreign to me, and I never played with it much. It is also one of the ancient spices used in Ayurveda and Indian cooking. Only recent have I come to learn about cooking according to your dosha, and it has brought me to a whole new level of how I perceive ingredients and spices. This recipe is simple, but the touch of cardamom makes it absolutely delectable. It is naturally sweetened with dates, and topped with toasted coconut flakes to add a depth of flavor you didn’t know you longed for. After I started toasting coconut flakes and adding them to my morning porridge, oatmeal, and cereals, I no longer want to use it’s plain and raw counterpart. This extra step is entirely worth it, and you’ll see why when you try it here. I didn’t originally put in the tablespoon of nut butter or seeds, but figured if you are longing for something more satiating and filling, that will do the trick. Considering this is just a drink, and not an entire meal, adding the protein bit will make it more substantial, but still be a light and satisfying breakfast or dessert. No ice was added here because we wanted something soothing and warming. Drinking beverages at room temperature or warmed a bit will increase their digestive ability. That is exactly what this recipe does. The amounts listed below make a small 1-cup drink. So if you’d like more, I’d suggest doubling it. Feel free to replace the coconut milk with almond milk or regular milk if desired, but I’m a sucker for coconut so that is where I went with this. Lastly, don’t forget to enjoy it! Sometimes things taste so good, you gobble it up without truly being present. Take a seat, close your eyes, take a deep breath and appreciate where you are. Savor every sip as you soak in this nourishing drink. In the end, your body will thank you as you give each individual ingredient the attention they deserve. If soaking dates, put in small bowl, fill with water, and allow to soak in room temperature overnight. This re-hydrates them and makes them softer and easier to blend up smoothly. 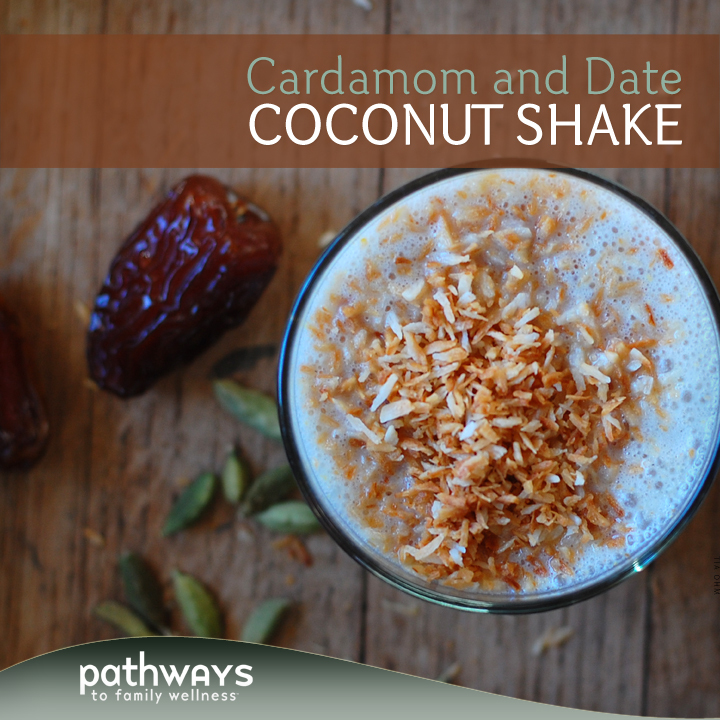 In a food processor or blender, combine coconut milk, dates, cardamom, and nut butter or seeds (if using). Blend until everything is well combined. In a small pan, add your coconut flakes and toast over medium-low heat for a few minutes, stirring to keep from burning. 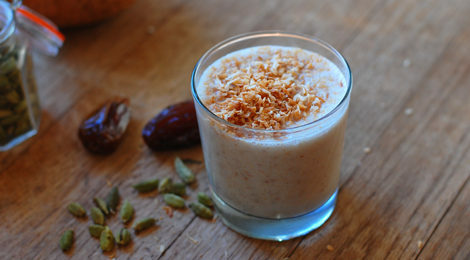 Add your shake mixture to a glass and top with toasted coconut flakes. Enjoy!